When Christ was born, HOPE was born with Him! But HOPE was never more fully alive than in His death! This simply makes no sense in our human economy. Had we been alive 2000 years ago and witnessed His gruesome death with our own eyes, I think it unlikely that we would have characterized that day as a day filled with HOPE! That God uses death and darkness to usher in our greatest HOPE defies human reason! And yet, tonight as I pray and beg God for a heart that will give new life to my daughter, I am haunted by the thought that her only HOPE lies in the death of another. But those thoughts are far too "weighty" for my own fragile heart and I must leave them in the hands of a Father who is all knowing, all powerful, all loving, and fully able to handle the things I can not even begin to understand. I can not explain why God placed His sovereign hand over the life of a broken-hearted orphan, abandoned on the streets of China. Or why through miracle upon miracle He preserved her life, and provided a way for her to finally come home! Or why on this Good Friday, that "hopeless" little girl now waits for a new life that can only be found in the death of another. But if the death and resurrection of my Lord teaches me anything, it teaches me that God can be trusted with things far too difficult for me to understand. That trust brings peace. And it brings a sweet confidence that I am welcomed before Him to ask with HOPE that this Easter morning will bring with it a new heart and a new life for our precious Rachel. Rachel's story has changed my own life in so many ways. And I've marveled as I've watched God use her story to weave Himself through the lives of the people I love. Ellie penned the story in her own words this week and it is proudly displayed on the chalk board in our kitchen for all to see! 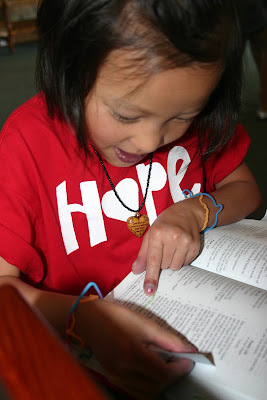 And Kate... how can I even begin to write of the beautiful ways the Lord is working in her precious heart? To hear the prayers of simple trust from her lips these days humbles me and reminds me why our Savior said that we should come to Him as a child would! Such yearning for Truth leads to many difficult questions, though, and I've wondered if she understood exactly what a new heart for Rachel meant for another child... for another family... until she came to me and Doug this week and offered her OWN! "I will give Rachel MY heart," she said, "and be the first in our family to heaven! "...as if she somehow thought this might be an acceptable exchange! Suddenly the reality of the cross and what it's HOPE cost Christ came fully alive in our home! The Gospel beautifully illustrated through the lips of an 8 year old girl! sniff-sob-snot bugger-snot bugger. Praying right alongside you friend for a new heart for Rachel and peace for the family of who will give her that precious gift. He is able. Love you friend! I will be praying so hard for a heart for your precious Rachel, for the rest of your family and for the family that will lose a loved one. Please keep us updated on how little Rachel is doing. I am praying for Rachel's new heart! What a precious, sweet child she is! What an amazing mother she has!!! Prayers for you and your family as you walk this difficult path. One thing you need to remember through all of this is the child who's heart will ultimately beat in Rachel's body was going to die anyway. The Lord will not take them so that she can receive their heart. The decision comes from the family who can know their child "lives" on through another. So yes, there will be tremendous grief and loss for a family but they will also know the joy of knowing that their child did not die in vain and will keep another family from suffering as they did. HUGS! Beautifully, honestly written. Will continue to pray for a heart for Rachel. It must be so bittersweet...and her sisters offer...brought me to tears!! Prayers for you, Rachel & the whole family until that new heart is here! Thanks for the update; been wondering how she was. My daughter is from Hangzhou, but not a heart baby. I am praying for your sweet Rachel and for you, her sweet momma! And your other daughters, oh my! They are precious! There is HOPE!!! So much!!!! In Him! I am called on to hope through your beautiful love for our precious Jesus. We also have a Rachel (American name) who requires a miracle that can only come about through the love of our Father. She is 11 years old and living in an orphanage in India, but the Indian government does not want to approve our file since we already have 5 children. This is most likely her last chance to be adopted. I am so grateful that our Risen Lord is so much bigger than the things of this world. I will be praying for your beautiful daughter. He is more than able to do a miracle in her life! I read your post as the devotional at my Church's women's meeting. Thank you for sharing your thoughts so eloquently!! !Now there is a whole group of women in NY praying for Rachel!! !